Matt and Marnie co-founded Austin Live|Work, a 10-acre tiny house community and future destination point for land development entrepreneurship. They’ve found that the ‘startup life’ has them hobnobbing with many local talents, including skilled tradesmen, designers, engineers, artists and the occasional brush-clearing llamas. 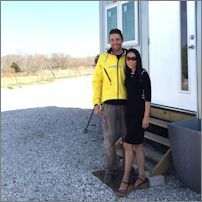 If you like tiny homes and business, and especially the business of tiny homes, you may want to check out Austin Live|Work in Turning Tiny.